Most American children, before they reach the age of 10, are quickly indoctrinated into that past time of watching televised holiday specials. In my day, such yuletide favorites included A Charlie Brown Christmas, Rudolph the Red-Nosed Reindeer, and Frosty the Snowman. One thing I found surprising was that in 1992, a non Rankin-Bass sequel to Frosty was released upon the world, called Frosty Returns. While the networks touted this as a sequel to the 23-year-old original production, I cocked an eyebrow in surprise. Yes, that’s right. Somehow, for reasons I’ve never been able to understand, many quickly shut up about the 1976 production, Frosty’s Winter Wonderland. If it hadn’t been for The Disney Channel (yes, the once good ol’ reliable Disney Channel of the 80’s/90’s), I’d have never know this production existed. Though in another sense, it feels almost like an alternate universe Frosty production. The title of the 1976 short has to do with how the song Winter Wonderland is worked into the plot. I guess they figured they could only do so much with the original Frosty the Snowman song before they were sick to death of it. Aside from a few cameos, the group of children and the environment seem totally different. Karen, fickle magician Mr Hinkle, and Hocus-Pocus the rabbit, are all MIA. So, just what happened with Frosty during the Winter of 1976? Well, that’s what I’m here to summarize for you. As snowflakes fall over a small, nondescript town, we see numerous children building a snowman, and singing the familiar song about Frosty. As we see them place a straw hat atop a snowman’s head, many are sad that this snowman isn’t going to come to life. One of the kids remarks that only the real Frosty could come to life. Run kid, he’s got that crazy look in his eyes again! As the kids wonder if Frosty meant what he said in his song (“But he waved goodbye saying don’t you cry, I’ll be back again some day”), our nondescript narrator walks by. This time, Jimmy Durante has been replaced by “Mr Mayberry” himself, Andy Griffith. For some reason, the artists have cluttered up Griffith’s ‘face’ with so many lines, he looks a little more scary than endearing. We then cut to the North Pole, where we find Frosty (voiced again by Jackie Vernon! ), who in the years since the first cartoon, has gained a yellow and orange scarf around his neck. We never know just how long he’s been up at the North Pole, as Frosty wonders when ‘some day’ will come for him to return. It is then that a newspaper blows into his view, and an article in The City Times, declares that the city is a winter wonderland. How does one send ‘ice stationary’ by Postal Service, anyway? This random city newspaper is all the incentive Frosty needs to declare that ‘some day is today!’ Going into his ice house (yes, Frosty has his own dwelling in the North Pole), Frosty sits down and writes a letter to the kids. It appears he writes it on a piece of ice with an ink pen, and sends it in a standard postal envelope to the kids. Who and where he addresses it to…well, that’s us grown-ups thinking too hard. The kids are overjoyed that Frosty is coming back (though in a sense, I still wonder about that first group that was there when he came to life), while the narrator then starts to hint at the topic of the episode, claiming the kids have a special surprise for Frosty. As if to back up this tale, we see the kids making a remarkably well crafted snow-cake, with a miniature Frosty and a female version atop it. So, the kids are planning to set Frosty up? Sure looks that way, folks! “He’s Mister White Christmas, he’s Mister Snow. We next see the kids having fun with Frosty, as our narrator watches them. However, we are soon introduced to our ‘villain’ of the piece, Jack Frost (played by Paul Frees, who voiced Santa Claus in the first Frosty special). Jack doesn’t seem at all happy that the kids favor Frosty over him. He manages to get several of them to listen to him, but even though Jack tells how his powers make winter happen (and even have the power to give the kids snow days from school! ), the kids still find Frosty to be more fun. Yes, even back then, logic was thrown out in favor of what was ‘cool and hip’ (a talking snowman trumps the ability to allow you to stay home from school?). It is then that Jack hits on a way to make the tables turn in his favor: he’ll take Frosty’s hat away, and that will be the end of our snowman. We then cut to the evening, with Frosty and the kids in a horse-drawn sleigh going out to the skating pond (yes, the town’s parents allow their kids to skate in the dark. Hope those ‘thin ice’ signs are well-illuminated). As Frosty sings a few verses from Jingle Bells, the kids note him singing ‘one-horse open sleigh,’ when there are two pulling theirs. “Oh, I could never count,” replies Frosty. Yes, part of the twisted logic of Frosty: he can write a letter to the kids, but he has trouble with numbers. As the kids and Frosty skate, Jack shows up nearby, and aims his North Wind at them. It ends up blowing off a silk hat on one of the horse’s, and Jack catches it, thinking he’s got Frosty’s hat. Jack happily rushes off, thinking his ‘problems’ are over. The next day, a few of the kids are about to leave Frosty and go have dinner with their family, when they notice he’s in a rather dour mood. Frosty claims that he loves having fun with the kids, but grows sad when they leave him. One girl says that what would cheer Frosty up, is if he had a wife. “What a great invention,” remarks Frosty. The next day, Frosty presides over the construction of his snow wife, from body size (“kind of chubby and plump”), to her height. Everything from blue beads to an old mop, and even a pink apron are used to dress her up. Wait, if Frosty’s hat brings him to life, how is he able to do that!? Then, like in the first special, the kids take turns trying to name her. Names thrown out include everything from Cleopatra, to Corn Flakes (a throw-back to one boy considering the name ‘Oatmeal’ for Frosty in the first Holiday special). Frosty then hits on the perfect name: Crystal. It is then that a new problem arises: how to bring Crystal to life. Some assume that ‘a ladies hat’ will do the trick, and use a bonnet from one of the sleigh’s horses. However, once it’s tied on Crystal’s head, nothing happens. The story then cuts briefly to Jack Frost, many miles away. It is then that Jack realizes that he got the wrong hat, and intends to go back to get the right one. This scene ends with Jack’s eyes glowing red, while he cackles and the music plays an upbeat melody. That’s Rankin-Bass for you: always peppy and jolly, even when it comes to plotting the demise of a living snowman. So, her ‘soul’ was trapped in some strange Christmas-y limbo until she got what she wanted? For that matter, could this be the same place Frosty goes to when his hat flies off, and he becomes a regular snowman? Are there ‘dead snow-persons’ wandering around, just waiting to be brought to life? Makes you think, doesn’t it? Frosty and Crystal then happily run around the countryside, with Crystal happily proclaiming they’re going to have a wedding! Wow. She’s only been alive for less than a few minutes, and she’s already getting Frosty set up with the ol’ snowball-and-chain (hey, that one was too easy to pass up). But just then, Jack Frost appears, and blows Frosty’s hat off, making him an inanimate snowman. As Jack happily dances around with the magic hat, proclaiming ‘No more Frosty,’ Crystal addresses her inanimate fiance. I guess in this world, snowpersons can hear other snowpersons, even when they are inanimate. Crystal pretty much says that Frosty can’t be gone. She then fashions a snow flower, and places it on Frosty’s chest where it would normally go on a Groom’s lapel. She then gives Frosty a kiss…and this brings him back to life! Yes, the power of love has nullified the ‘old silk hat’ of the classic song, and Frosty seems to be alive for good (well, until Spring thaw). Needless to say, Jack is upset that his plan backfired, and chucks the ‘magic’ hat back at Frosty who catches it. Frosty and Crystal, in the cold of the night, make their way to the local town, shouting out to the kids that it’s time to have their wedding. The kids eagerly awaken (it must be well past midnight), throw on their winter wear, and rush outside. Of course, not a single parent or adult is there to see these walking/talking snowmen, and it seems the parents have all slept through their kids getting out of bed and rushing out into the night to serve as witnesses to a snow-marriage. Will wonders never cease? The kids rouse Parson Brown (as referenced in the song Winter Wonderland) from his sleep, and he shows up to meet Frosty and Crystal. Not only is he not wearing anything to bundle up against the cold night air, but the meeting of real life snow people doesn’t phase him in the least. The only thing he finds ‘wrong’ about the whole situation, is that he is able to only (legally) marry real people, not snow people. The kids and their friends are at first dejected, until Parson Brown solves their problem: If they wish to have snow people marry, they need…a snow parson! So, the kids quickly build a snow parson. Dressing him in a waistcoat, spats, and glasses, he almost resembles Parson Brown. They even use the Parson’s hat, but this does nothing. “A parson’s not a parson unless he holds The Good Book in his hand,” proclaims Brown. Taking his copy of The Bible, he places it in the snow parson’s hand, and he comes to life (with another cheery “Happy Birthday!”), albeit speaking in the same voice as Parson Brown(!?). So, that’s it then. With this episode, we’ve just cancelled out completely, the power of magic hats established in the first special. Items to bring snow people to life seem like portkeys in the Harry Potter universe: they can now be anything! We’ve seen snow flowers, a snow wife’s kiss, and The Good Book work their magic. Jack accepts, and everyone cheers. With this acceptance, Jack quickly forgets about his previous intentions to off Frosty. The ceremony then begins, with Andy Griffith singing parts of the song Winter Wonderland. We then get a couple small images of Frosty and Crystal by a crystallized fire, and then…them playing with snow-children and a snow-dog. However, the vision doesn’t last long before we return to reality, and the snow parson finishes services. It should also be noted that the snow parson then disappears, forever. Whatever happened to him, we never know. Maybe Parson Brown took his book back, leaving the snow parson trapped in a hellish limbo, upset that he was only created for one purpose, with no chance for a normal life like Frosty or Crystal. Now that I think of it, aren’t Frosty and Crystal living in a state of snow-sin since they’ll have no way to go to Church on Sunday? The narrator then returns, and explains that the snow couple, Jack, and the kids continued to have fun into the new year. But when April comes along, the temperature begins to get warmer. Crystal feels they should head to the North Pole, but Jack Frost claims that with his powers, winter and the fun they are all having will never need to end! So, Jack messes up weather patterns just so he can stay in the kids and the Frosty’s good graces. Needless to say, none of the parents or other adults in the town have any spine (they’re as bad as the Junctionvillians in Twas’ The Night Before Christmas), so they foist the responsibility of setting things right, on Parson Brown. Brown explains that with winter still going on, life cannot blossom and grow, claiming ‘nature made a promise’ to these plants that they would bloom and blossom one day. Brown’s ‘guilt trip’ is just the ticket, and Frosty, Crystal, and Jack decide to head back North…but not before going on a little skating ‘parade’ through town, to the tune of the old Frosty the Snowman song, albeit now including Crystal in its lyrics. Most sequels have a small cameo or reappearance by a supporting character, and we finally get one. Who is it? Karen? Professor Hinkle? Hocus-Pocus the rabbit? Nope. We get…the Traffic Cop. Addressing Frosty, he claims that he isn’t surprised anymore (and by the sounds of his voice, they got that whistle out of his throat). Crystal introduces herself, and the couple and the kids continue on their way. It is only after they’ve left, does the shock of ‘a snow wife’ hit the officer, and he swallows this whistle too! I guess we can hope that next year, the couple won’t be showing up with snow-children and a snow-dog. Down at the train yard, Frosty, Crystal, and Jack Frost board a train headed north (looking just like the same one from the first episode), and take off, with the kids waving goodbye. Once Jack Frost is gone, the spring thaw hits. The kids swim in the lake among the greenery and flowers, and the narrator (now wearing a ranger’s hat and outfit) appears before us. He goes on to explain that though the ‘winter wonderland’ is now only a memory, it was a good memory, and those can never die. The narrator then goes on to say that the first snowflake will fall once again, and as if by magic, one hits his nose, and high above him in a tree, we see Jack Frost. The final images show the kids, the Frosty’s, and Jack playing on the frozen pond. “May all your winters be wintry,” proclaims the Narrator. “And frosty too!” chime in Frosty and Crystal, before we see everyone laughing in the snow, oblivious to the fact that a snow parson is trapped in limbo, and they’ve messed up the seasons by denying Summer and Fall to occur. Ingrates. And that was Frosty’s Winter Wonderland. While not as ‘messed up’ as Rankin-Bass’ ‘Twas’ the Night Before Christmas,’ it has some charm to it. Even so, it never quite reaches much of an emotional peak like in the first special, when in Professor Hinkle’s mad desire to get his hat back, he traps Frosty in a greenhouse, causing him to melt into a puddle of water. As far as narration goes, Andy Griffith exhibits plenty of that down-home charm to his voice, but as can be expected, he’s no Jimmy Durante. One does have to also wonder, why Rankin-Bass saw fit to make a sequel to Frosty after 7 years. Then again, they also did a couple sequels to their stop-motion classic, Rudolph the Red-Nosed Reindeer in the 70’s. Speaking of Rudolph, the nasally-empowered reindeer would also cross paths with the Frosty’s in the 1979 stop-motion production, Rudolph and Frosty’s Christmas in July. Christmas in July would also be the last ‘official’ Rankin-Bass television special for these characters, and also the last time Jackie Vernon would voice Frosty. Speaking of Vernon, his vocals for Frosty in Winter Wonderland seem a little ‘stilted’ compared to his readings for the original short. It almost seems that Shelley Winters as Crystal got the more emotive pieces of the snow couple. and pretend that he’s a circus clown. until the other kiddies knock ‘im down! Even though PIXAR Animation Studios has impressed us with their mastery and craft regarding computer-generated imagery in films, one mustn’t forget their original stomping grounds: animated shorts. Back when the company was trying to prove itself, the one way to build up its reputation was by creating short films that told small stories, and also helped develop new technology and experience for the small crew. In a way, this was similar to what Walt Disney did with his studio in the 1930’s. Not content to just make Mickey Mouse cartoons, Walt developed the Silly Symphony shorts as a way to develop storytelling, and advance the skill of his studio artisans. When Blu-Ray was beginning to gain attention in 2007, PIXAR released their Short Films Collection, Volume 1. This release included all of their short films up through 2007’s Lifted, which played with Ratatouille that summer. Five years later, we have the release of Volume 2. Your Friend The Rat, Presto, BURN-E, Partly Cloudy, Dug’s Special Mission, George & A.J., Day & Night, Hawaiian Vacation, Air Mater, Small Fry, Time Travel Mater, & La Luna. It’s interesting to note how the creation of shorts in the last 6 years has changed from the ones included in Volume 1. Half of the Volume 2 shorts were created as home video release extras. Each of the shorts contains an optional audio commentary to listen to. I love commentaries by PIXAR’s personnel, because they are usually full of facts about the production, and thoughts about daily life. One commentary I really liked was Peter Sohn’s for his short, Partly Cloudy. I didn’t really warm up to the short when I first saw it, but hearing how Peter made the short almost like a love-letter to his Mom, it really put a new light on it. Of the shorts included, George & A.J., Small Fry, and Time Travel Mater are the only ones that are exclusive, as they haven’t been included with any other Blu-Ray/DVD release. Of the three, George & A.J. is the oddball of the group. Done using drawn images and put together in AfterEffects, it holds together more as a series of gags than a story to me. Even writer/director Josh Cooley’s commentary attempts to bring in a smooth-sounding narrator to add some comedy, but this also fell flat for me. For me, while I love the concept of Time Travel Mater (which was originally envisioned as a Back to the Future parody), I still get a charge out of Small Fry. Originally released in theaters with 2011’s The Muppets, this short involved Buzz Lightyear getting stuck in a fast-food restaurant, where he finds a support group for discarded ‘fun-meal’ toys. PIXAR seems to have cornered the market on fun therapy-session scenes (remember the ‘fish are friends, not food’ meeting in Finding Nemo? ), and it helps that writer/director Angus MacLane has several psychologists in his family. A still from Andrew Stanton’s student film, “A Story.” Is it me, or does that big guy’s coloration look a little familiar? Each of the directors gives a little introduction regarding their shorts, each of which has been restored in high-definition. One can kind of see each of the director’s trademarks that would shape the films they’d direct in the future. For example, John Lasseter’s student films deal with inanimate objects with personality, which he would parlay into the short Luxo Jr, and later films like Toy Story and Cars. One of the marketing techniques Disney has done with many of their discs, is release them as a Blu-Ray/DVD combo pack, and Volume 2, unlike Volume 1, includes a DVD disc containing almost all the same features as the Blu-Ray. Though those with Blu-Ray players will be treated to a crisper, more colorful palette when viewing the shorts. Of course, the big question some of you may be asking is, “should I get it?” Well, yes and no. If you’re one of the many legions of major PIXAR fans, you’ll definitely get a copy. What could deter some of the less-infatuated from seeking this title out, is the fact that 2/3 of the shorts in the collection are most likely on other DVD’s in your collection. As well, Volume 2 is not one of those discs that you find marked down at your local department store. The lowest price I was able to find it for was $28 on Amazon.com. These were the words that were often used to describe Walt Disney Picture’s 52nd full-length animated feature. Taking place within the world of video game consoles in Litwak’s Arcade, this was definitely not a fairy-tale story. According to the opening foreword by director Rich Moore, John Lasseter (Chief Creative Officer at Walt Disney Feature Animation & PIXAR Animation Studios) called him up to ask if he would consider coming in to work on an animated feature at Disney. This would be Rich’s first feature production, given that much of his reputation came from working on Matt Groening’s The Simpsons and Futurama. Rich accepted John’s offer, and soon found himself down at the House of Mouse. Upon finding out that there had been development of a video game-related film for years that hadn’t been able to find its niche, Rich and several others ran development on the film, and soon found a storyline that stuck. Lasseter’s bringing an outsider into the folds of the studio, reminded me of the same move that he had done almost a decade before, when he rang up Brad Bird, and invited him and several of his co-horts (who had worked on The Iron Giant) to develop something at PIXAR. Just like The Incredibles was a step outside of the comfort zone for PIXAR’s animators, Wreck-It-Ralph was a hard right-turn away from what Disney’s animated features normally brought to mind. The Art of Wreck-It-Ralph showcases plenty of material, such as creating contrasting environments, designing 8-bit video game characters to move properly, and much more. One of the sticking points for me when it comes to Making-of books, is how much verbiage there is in relation to the art. While the book is not chock-a-block full of text, there is enough in the opening pages to give us a general idea regarding the craft and care in making this film. There are also candid quotes throughout the book, from various members of the crew as well. Image-wise, the character development is very in-depth, notably that of Ralph. The concepts show Ralph’s concept art taking him from being a hairy beast with spiky claw/hands, to a rotund gangster-looking fellow, before ending on his final hillbilly-like features. Almost all the main and supporting characters are given a few pages to show their development, including the tenants of Fix It Felix, Jr’s Niceland Apartments complex, where the citizens are square-shaped, and move in a blocky fashion. One of the most interesting pieces of concept art, were the images of Sergeant Calhoun in rough pencil, done by Glen Keane. With the dearth of new artists at the studio using digital technology, seeing some of the old guard at work on developing the characters was definitely eye-opening. Also of note are the development of the environments that are showcased. Unlike some films from Disney that take place within one large world, Wreck-It Ralph has 7 different worlds to deal with. Key to the film are the early 80’s 8-bit world Ralph is from, the gritty first-person shooter world of the modern-day Hero’s Duty, and the candy-coated styling of the late 90’s arcade racing game, Sugar Rush. Rich Moore, Mike Gabriel, Brittney Lee, & Lorelay Bove analyze a candy-filled mock-up of Sugar Rush’s town square. The detail in the artwork is nice to observe, and the concepts for Hero’s Duty stand out more here then in the film. It also helps that the concept art for the game, was done by artists who have worked on concept art for similar first-person shooter games for other companies. Though when it comes to development, it looks like Sugar Rush was the one place that really had plenty of it. 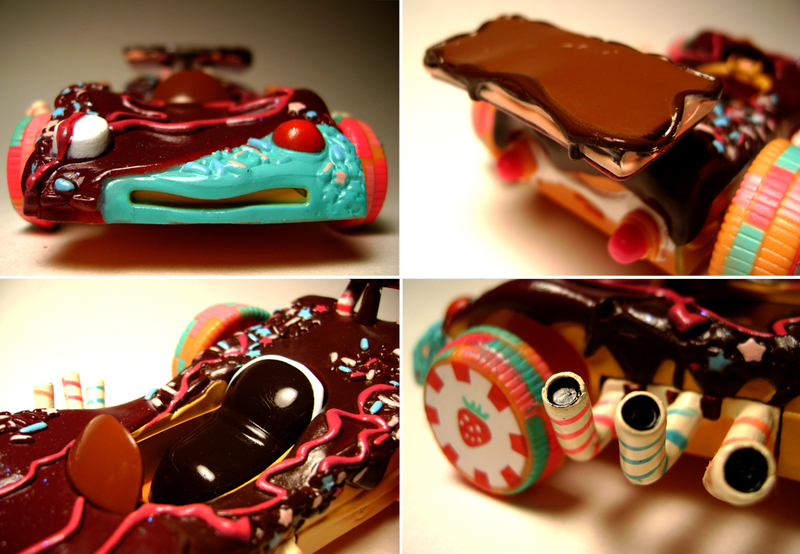 Thorough detailing was used, from recreating the grand stands of the game’s big race in physical form, to viewing the lighting and texture of real candy. The details that were created are pretty detailed, to the point that when my friend and her husband went to see it, he claimed he felt a little nauseous looking at the landscape. The development of the race cars is also a high-point in the book’s art. One can only guess that what we see here is but a fraction of all the different concepts that were made utilizing all sorts of candy-stuffs. We also get a final section in the book that deals with deleted scenes, characters, and environments. After seeing the film twice, I’m glad they decided to not include these in the final product. Even so, the section offers a nice example of how not all stories are perfect the first time they are pitched. Unlike some of the Making-of tomes from Chronicle Books, authors Jennifer Lee & Maggie Malone actually have the inside track when it comes to writing about this film. Malone works in the development department of Disney Feature Animation, and Lee was one of the co-writers on Wreck-It-Ralph. Their final product is a wonderful book chronicling the making of this film, unique to the legacy of Walt Disney Feature Animation. Retro Recaps is where we will look back at old television episodes from the past, and analyze their story, content, and much more. To some people, the only thing better than having a favorite television show, is hoping in some way that you could infiltrate it, and do something truly awesome. Hence, people who think they have an awesome idea for an episode, would write or type it out, and send it off to the studios, eager to hear back that their brilliance was rewarded. However, this almost never happens. Fanmade scripts are often tossed aside (hey, the actual scriptwriters gotta eat, y’know!). But, in 1991, a series of amazing circumstances actually brought one of these fanmade scripts into the proper hands. Renee Carter, Sarah Creef, and Amy Crosby were three girls who loved the Tiny Toon Adventures series, and in their free time, concocted a script titled Buster & Babs Go Hawaiian. A one-in-a-million chance event ended up delivering their script into the hands of Steven Spielberg at Amblin Entertainment, where it was seen as potential story material! The girls were flown out to California in February of 1991, where they met Steven Spielberg, and even had a story session with the show’s writers to tighten up the material. Also a bonus, was that like many of the staff, they ended up being caricatured in a small scene in the episode (though they do not provide their own voices). An article in People Magazine, also mentions that they were paid pretty well for their concept, which originally went from an offer of $250, to $3900 (and to 13-year-olds, that was a lot of money back in 1991!). You can find another article about the girls in the archives of their hometown newspaper, the Hampton Roads Daily Press. Simply Click Here. A caricature of the three girls, that appeared after the title card of the episode. Though they got a lot of press in some of the big entertainment magazines, I first heard of them at that time when they appeared in an issue of the magazine, Disney Adventures, which also featured a picture of the girls with Steven Spielberg. I’ve since lost the issue, but I remember the fact that these girls not two years older than me wrote for one of my favorite animated shows at the time was definitely something. Buster and Babs Go Hawaiian didn’t appear on television until November of 1991, and much how each episode was developed around a central theme, the story written by these 13-year-old girls was the glue that held it together. So, let’s get a little introspective with Buster and Babs Go Hawaiian. …Buster and Babs appear, stopping production, and upset about the day’s episode containing both a mediocre script, and no starring roles for either of them! Leaving Hampton in anger at being denied a starring role (“I even got the girl!” he pleads), the two rabbits go to the scriptwriters, but find no sympathy. They then decide to go straight to The Big Guy, and burrow their way to an undisclosed studio in Hollywood. We next get a few shameless caricature/cameos. First up is Robin Williams as Peter Pan. Close behind is Dustin Hoffman as Captain Hook (albeit sounding and looking more like his character Raymond Babbitt from Rain Man). These two cameos were like ‘coming attractions,’ as Hook would be released in theaters almost a month after this episode first aired. Even with their star status, Buster and Babs are unable to get permission from the guard to go through (even though he lets a familiar-sounding rabbit named Roger pass! ), so, they burrow their way underground, and into the lobby of Spielberg’s production company, Amblin Entertainment. We get another series of cameos in the Amblin lobby. Impatiently waiting to see Steven, are Christopher Lloyd as Doc Brown, George Lucas in a Darth Vader suit, and Broadway producer Andrew Lloyd Webber in a cat suit (because he produced the Broadway show, Cats…get it?). However, it’s soon seen that Spielberg is talking to a video game he’s playing. The two get his attention by (accidentally) pulling the game’s plug, and plead their case that they want a decent script. It is then that Steven gives them the script written by the girls. Simply based on the title (after all, who reads scripts these days? ), the two agree to do it. After leaving the offices, the two get to work reading the script, and Buster soon starts to panic. Apparently, some of the episode will take place on an airplane, and Buster has a contractual stipulation that he doesn’t do plane scenes, on account of his fear of flying. Calling up the girls, he’s pulled through the phone to one of their bedrooms. The girls discuss his concerns, but claim that stipulation or not, they won’t change the scenes. With that formality out of the way, the episode gets started, with Buster and Babs checking their luggage at the airport (checked/eaten by Dizzy Devil). Making their way onto the plane, Buster’s aerophobia isn’t helped when the in-flight meal is served by Plucky (a choice is provided of grey lumps in brown sauce…or brown lumps in grey sauce). Upon arrival in Hawaii, the two are greeted by Shirley the Loon, and Fifi la Fume, who greet them with a traditional lei welcome (with optional flower-killing guilt provided by Shirley). …but quickly change their mind when they find out Elmyra is manning the rental car desk! Flagging down a taxi, Babs asks Buster how he got a credit card. Buster claims that it isn’t his…it’s Bugs Bunny’s! It is then that Bugs makes a small cameo, first shocked at this revelation, and then voicing his displeasure upon finding the empty card slot in his wallet. We return to the story, with Buster and Babs checking into their hotel, where they are greeted by Go-Go Do-Do as the Concierge, being his usual wacky self. After his harrowing experience on the airplane, all Buster wants to do is relax, but Babs pleads with him to go sightseeing. He gives in, and they go on a helicopter tour of the island’s volcanoes. While Babs enjoys it, Buster copes with the situation as best as he can. After getting his land legs back, Buster decides to hit the beach nearby and go surfing. While catching some waves, he has a close encounter with a shark (actually, Elmyra with a fake fin on her head, requesting Buster ‘play Treasure Island’ with her). The scene later cuts to Buster and Babs attending a luau inside an active volcano. Naturally, the volcano ends up exploding, pitching our two rabbits out to sea. A cutaway shot shows our two rabbits adrift in the volcanic aftermath, before Buster spots land in the distance! And with that, the (unnamed) director of the episode yells “Cut,” and the production of Buster and Babs Go Hawaiian is complete. Steven Spielberg and the girls show up in a golf cart afterwards, with Steven thanking the two rabbits for their hard work. He also presents them with a new script the girls have written: Buster and Babs go to Mars in a Rocketship! …and presents Buster with a large credit card bill that the two rabbits racked up in Hawaii! Realizing they need to get away, Babs grabs Buster, and the two hightail it to a nearby rocketship, heading off to Mars (with Buster inside nervously repeating how much he hates flying). And that was Buster and Babs Go Hawaiian. While the episode isn’t the most solid episode of the show, there’s still plenty of fun little entertainment cameos here and there, not to mention that the episode also is the only time in the history of the show, where Steven Spielberg voices himself. All his other ‘appearances’ are voiced by Frank Welker (who in some episodes, does a pretty good job getting down some of Steven’s nuances). Still, I think hearing Steven Spielberg saying “Get out of here you no good vermin,” is one of the wildest things he’s ever uttered. One can only imagine what the recording session was like. I will admit I truncated a few scenes in the episode (yes, I’ve become what I’ve feared most: a condenser! ), such as a parody of the American Express Travelers Checks commercials, and a ‘special report’ segment where a man explained about Q-tips. When putting together this blog post, I did wonder what became of the three girls. I did a small Google search, but came up with next to nothing. In their People Magazine interview, Amy Creef and Sarah Crosby spoke of their dreams to become singers, while Renee Carter said she would love to work for Warner Bros Animation. According to IMDB, Renee has done a couple other projects in Hollywood, including serving as executive producer on an animated short, titled The Bed Bug Thing. In a way, the episode was like those old tour-de-force celebrity production numbers, where you got alot of famous faces together for a big production. Warner Bros attempted such a mish-mash with the main Looney Tunes characters with Space Jam, and Looney Tunes: Back in Action. However, even Buster and Babs Go Hawaiian stays short and sweet, while those movies ended up seeming like a long schlep to get through. One sad note has been how Warner Bros has treated Tiny Toon Adventures over the last few years. The studio started releasing the series on DVD, but only got as far as releasing two volumes of the first season. Buster and Babs Go Hawaiian appeared during the show’s second season, and as of now, there’s been no word if we’ll see any more volume releases. Warner Bros did the same start-and-stop routine with Animaniacs, which only got as far as Season 3. I say it’s a sad note, because one could easily imagine these girls (now grown women) eagerly purchasing the DVD set, and showing friends and family how they made it on television! *Update* When I first wrote this review, I had no idea that Warner Brothers was in the process of readying Season 2 of the series for DVD release! Now, Buster and Babs Go Hawaiian, and 16 other episodes of Tiny Toon Adventures, has been released on the DVD set, Tiny Toon Adventures – Crazy Crew Rescues! Needless to say, a DVD review for it was in order. Click Here to read some of my thoughts on it. After seeing Wreck-It-Ralph when it was released, I was surprised by an astonishing realization. This was the first year that a Walt Disney Feature Animation release actually was more entertaining to me than a release from PIXAR Animation Studios. The emotional one-two punch just wasn’t there with Brave, but Ralph delivered in spades (along with the attached animated short, Paperman). I also wonder if I’m a little biased towards Wreck-It-Ralph, due to his adventures in the racing world of Sugar Rush (I’m a big fan of things with wheels). The land is a combination of Mario Kart, and the world of Strawberry Shortcake, in which little kids with candy-related names, race across the cavity-inducing landscape to take 1st place. With over 16 racers in the game, Disney’s marketing people must have seen this as a slam-dunk for merchandising potential. The majority of merchandise for the film (created by their in-house marketing and design team) centers around the myriad racers of Sugar Rush, from plush dolls to character sets of pins and erasers. However, the most interesting push has been the release of over 12 different racers and their vehicles as seen in the film. While the packaging screams to ‘collect them all,’ I’ve chosen to collect just two that are integral to the film’s plot: Vanellope Von Schweetz, and King Candy. We are introduced to Vanellope when Ralph makes his way into the Sugar Rush arcade game. Though a little bratty and big-mouthed when we first encounter her, we soon find that she’s a glitch within the game, who just wants the chance to race. A still from the film, where Vanellope shows off her sweet wheels to Ralph. With Ralph’s help she acquires a racing kart, though not quite as pretty or perfect as the other racers. It’s a mish-mash of frosting, sprinkles, gummi worms, cookies, and other odds-and-ends. Even so, she loves it! In a strange way, much like the denizens of Sugar Rush don’t want Vanellope to race, it almost felt like the packagers don’t want us to even take her out! The little figure of Vanellope was not only held by a larger twist tie, but one inside the plastic holding her down as well! Once I got her out of the packaging and into her car, it was then I noticed a big problem. In the film, the kart’s seat is a cream-filled chocolate sandwich. But in the toy form, Vanellope doesn’t sit on this so much lean back on it. To put her in the kart, one has to push her right up near the front windshield, and even there, her hands don’t come close to the area where the steering wheel is (not that her hands can actually hold it). Once I started going over the design of her kart, I was torn regarding what we had on hand. The marketing and product design team working for The Disney Store and The Disney Parks usually do some top-notch design work, but the work on Vanellope’s vehicle is kind of a mish-mash of quality. There’s great detail such as the myriad sprinkles and icing on the layer of chocolate, and there’s even a nice bit of dribbling for the chocolate coming off the wafer/spoiler in the back. However, I was a little disappointed in the wheels and pipes along the sides. If one compares the pipes in the toy to the film still above, it almost looks like the colors of each was inverted. The wheels could have been a great place for some sculpting to shine. The raised gummi-worm treads would have added a nice level of dimension instead of the more generic ‘flattened-worm’ look we get. As well, the wheel designs are a mixed bag. The colors and designs are just off in certain places, like the rear left cookie wheel, which is white in the film (here, it’s black). The figure of Vanellope is a well-sculpted design, and even has movable arms and legs. However, due to her body design, you’ll need to make alot of attempts before she can even stand upright outside of her kart. This was one toy I was really hoping for a good level of screen-accurate detail. However, little areas here and there had me a little sad that this sculpt couldn’t have been improved on a bit for a much greater final product. Sugar Rush and its daily races are presided over by King Candy (Alan Tudyk), a rather jovial ruler who is often bouncing around, telling his subjects to ‘have some candy!’ He’s also known to enter the races himself. In this clip from the film, King Candy seems happy to see us. Candy’s racer is much simpler than those of the other competitors. It appears to be sculpted largely out of white chocolate, with several darker chocolate pieces in place for his vehicle’s chair. King Candy’s figure has a large head and tiny legs, which is a dis-advantage for him in one respect: he will not stand on his own. In that respect, Candy seems more at home inside his royal racer. Unlike Vanellope, the seating inside his kart seems nice and simple. When he sits down, he appears to be perfectly suited to his new driving environment. – the film image above shows a slightly darker-white body than the toy. As well, the flower patterns inside the wheels should be white frosting, not pink. The fact that Candy’s toy kart does not have little flags on the rear can be avoided by me, as these would definitely be seen as choking hazards for children. Even so, the three horns on the right-hand side add a nice little detail to the relative uniformity of the vehicle’s design. It’s easy for me to overlook much of the coloration differences in King Candy’s kart between the toy and film versions. 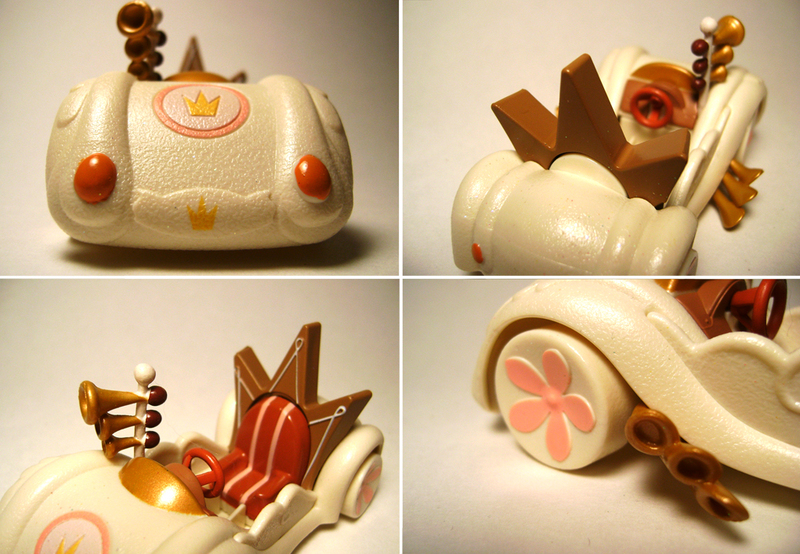 The simplicity of the design carries over nicely into toy form, with the figure of Candy sitting nicely in his royal seat. One feature each of the racers comes with, is a small key that acts as a launcher. Once a key is inserted into the rear of the racer, a click signifies that it’s locked. Pushing the button on the side of the key unlatches it, and the car takes off. Each of the keys appears to be the same size, so one doesn’t have to worry about having multiple different keys. Vanellope, King Candy, and the additional Sugar Rush racers are available as Disney Store exclusive merchandise. Priced at $9.50 apiece, the price seems a few dollars higher than what I would say they should be priced at, but as with anything having the Disney name on it, you do pay a little extra. Along with my early love for animation, I also became intrigued by special effects as a youngster. My mind was blown seeing DeLoreans disappear in a flash of smoke and fire trails, of animated characters moving real-life chairs around, and in 1993, seeing computer-generated dinosaurs that just had me wishing my family’s Macintosh Performa could do what I was seeing on the big-screen! Unknown to me at that time, the magazine world had a publication that would be a dream come true for my ‘acquired tastes.’ I still remember going down to Cedar Rapids, IA in December of 1997 with my family, and visiting the Barnes & Noble there (the closest one to my hometown of Waterloo, IA at that time). I had been amazed by James Cameron’s Titanic a few days before, but almost every store had already sold out of the official movie ‘companion’ book. It was while perusing the periodicals, that I came across Issue 72 of Cinefex. That $8.50 purchase was like a portal to me. Encased within, were stories and anecdotes on bringing back to life the once proud ship, and then sinking her using as many modern day effects tools as possible. Cinefex also broke down the different effects shots by company (over 14 in all!). Over the next 15 years, I’d purchase the magazine periodically, and read up on some of the films I was most curious about. Cinefex would often cover films that I couldn’t find detailed making-of material anywhere else (such as A.I. Artificial Intelligence). After buying an iPad 2 in 2011, I was hesitant to actually buy any magazines or subscriptions for my newsstand app. Entertainment Weekly just didn’t do it for me anymore, and I was wary to drop money on the UK’s Empire magazine (not that they aren’t a good publication, I’m just a little too cheap). But to me, the iPad’s screen seemed the perfect size to be filled with the pages of Cinefex. It just so happened that the magazine was also eyeing the realms of digital publication, and in August of 2012, they released their app, designed by New Scribbler Press. The scrolling menu showing all of Cinefex’s issues. Once the application opens, you are treated to a horizontally-scrolling ‘issue library,’ showcasing covers from every issue of Cinefex. Any issues you purchase will be seen above the library area, in a zone marked ‘My Issues.’ Currently, issues #128 to the most recent issue are available for single purchase, but there are expectations that soon, the entire Cinefex library will be available for single-issue purchase. As of my writing this review, issue #127 is available as a free download to test the app’s capabilities. However, I decided to actually complete a purchase, and went for issue #130, which detailed the effects work of such summer productions as Marvel’s The Avengers, and Prometheus. Price-wise, paying $4.99 for a digital edition of the issues feels more comfortable to me than paying $12.50 for a printed issue (and a little easier than scoping out multiple Barnes & Nobles for the latest release). If you are connected to the internet through Wi-Fi or a 3G connection, you can even archive your purchases, and pull them back up at a later time, saving you valuable shelf-space around the house. While price and storage convenience of the digital publication are nice, the app’s navigation compared to the printed version is a bit of a learning curve. Tapping anywhere on a page of the issue, will bring up the navigation bar. Instead of the text and pictures grouped together, each article has its text on a single page that can be scrolled vertically to be read. Images and digital media related to the article, can be viewed by scrolling horizontally. The high-point of the digital publication, is the interactivity afforded the articles. Unlike the printed magazine, one can see progression video of various effects sequences, get more comparison shots, and behind-the-scenes still images. Interactivity also extends to several ads for visual effects houses, or effects-related software or tools that are in the publication. Several of the ads in the publication function as mini-commercials (thankfully, you control if you want to watch them or not). The addition of video content to Cinefex provides a great way to show layering and compositing of digital effects (topmost image). These stills are from a compositing reel from Industrial Light & Magic for the film”Battleship,” showing the multiple layers used to make the final film image seen above. Of course, the app is not without some flies in the ointment. Given the amount of data involved, it took some time for issue 130 to load via my Wi-Fi connection. I also got a few network errors saying there was trouble retrieving inventory status, once I archived issue 127. One thing I do wish the digital copy would have, is a bookmark feature. The app has crashed on me several times, and I’ve usually had to start from square one, and either use the ‘history’ function, or flip through pages to get back to my place. Personally, I wish the format would be closer to the printed magazine structure, with the ability to enlarge pictures, or click on icons to open some of the video features, or see various pictures showing some of the effects work. There is at least a way to send feedback regarding the app, so it’s nice to know there’s been some effort put forth to listen to the readers of the publication, and continue to enhance and improve on the app over the course of its lifespan. The digital publication of Cinefex is definitely a good thing in my eyes. Those with iPads who don’t have access to a Barnes & Noble, can now gain easy access to this information. Plus, the promise of digital back-issues for purchase will help satisfy special effects fanatics both young and old, and those just beginning their fascination with behind-the-scenes material.